Bagley Briefs: My, What Nice Ears! While I was in Colorado Springs, Kellie could often be seen wearing her bunny ears. She was so funny about how her ears would look, too. Sometimes they were folded in, sometimes twisted not too often were they upright. I suppose it was dependent on her playful attitude at the time. Or, maybe she didn't like the airflow disturbance! 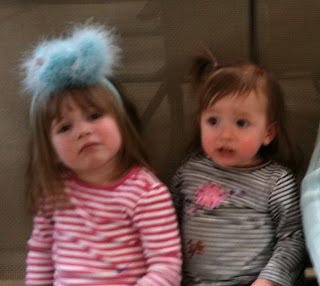 All I know is, they created a ticklish moment when hugs and kisses were shared while bunny ears were on her head!